I just read > this blog article < and thought I'd share it with you guys. It's about positive feedback, and how it is not only nicer than conscious criticism, but also far better in creating a constructive learning experience. It may sound obvious, but often lost - especially among internet forums. We probably all know how easy it is, as a programmer, to get caught in a negativity trap where all the code is just a blur of "WTF" and "ugh" - not only our own, but also the one others show us. This is bad. It is destructive and it hinders improvement and I think it is a good thing to maintain a certain aspect of positivism. Don't overlook bad things. Mention them, explain them, but do not dwell on them. Do look for good things. Elaborate why they are good and how awesome they are. For every point of critique, look out for 4-6 positive things. It's quite easy, yet overlooked as easily. When reviewing someone else's work, it is a common practice to focus on criticizing less-than-optimal bits, and this can be helpful - but we shouldn't stop there. Reinforce the good stuff as well! We are still a very small community, and while this can be a caveat, it is also our chance to start with a good example and create an atmosphere of positive reinforcement, kindness and creativity - and I think you are already doing great. As new users join us, they will be welcomed by the environment to which everyone of you contributes, and I am incredibly glad to see how helpful you already are when stepping up to support the ones who need advice. Keep it up. Seriously. This is not a small feat. So why am I writing this? Simply because I think that the spirit of a positive environment deserves some resonance. It is a rare good and a treasure to find. True. 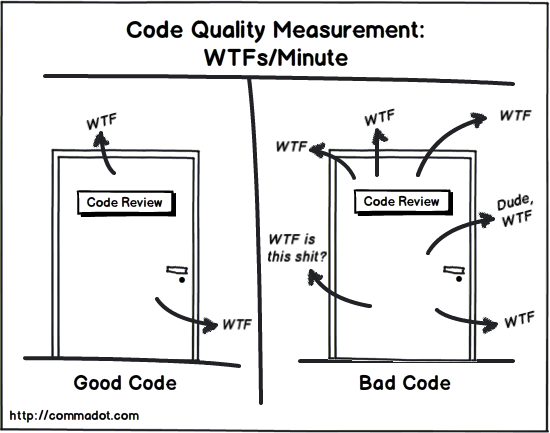 I've experienced this myself Not even sure whether there is code without a single wtf when reviewed - though I guess 50% of those would disappear if there was an explanatory comment for every questionable line. Good documentation is a very valuable thing.